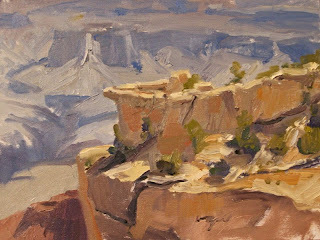 The title of this one evokes the feeling of the South Rim of the Grand Canyon and the series that I have been exploring in my paintings of this amazing place. This particular spot will be familiar to any of those that have hiked down the Kaibab Trail. 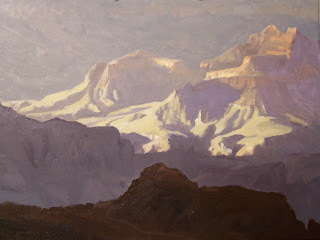 This was a painting I had not seen for years, and had never taken picture of. A kind of image I will probably return to someday. More about multiplicity than unity and classical irony rather than a romantic moment. But I have always suspected that those modes (or moods) hide within each other. A trip to visit old friends in Durango brought me home to Colorado which was amazingly lush and verdant. 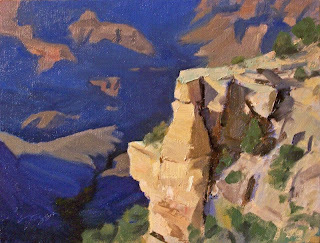 This is one of the raw plein air views I painted last weekend at the Grand Canyon. This is from a spot on the South Rim where I found myself in the rain after a day of painting waiting and waiting to see if the sun was going to make that one last appearance where it shoots a beam of light up the canyon from under the clouds. I'm exploring more greys and earth tones lately and feeling good about the atmospherics. 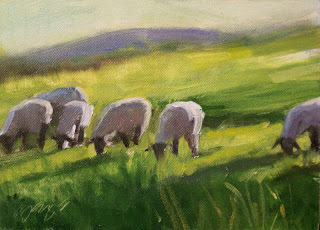 This started as a plein air study and was taken further back in the studio. While I was painting this a number of people walked out unto the ledge of this formation, but I was shocked when one guy jumped down onto the further and smaller formation - posed for pictures - and then jumped back! 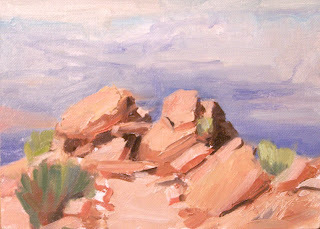 Plein Air at the Grand Canyon from last weekend. 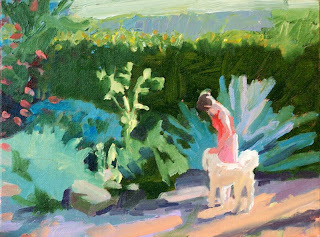 When painting from life outdoors I really like to keep it spontaneous without getting overly illustrational. Loving the warm morning light before it became too hot at the South Rim of the Grand Canyon! 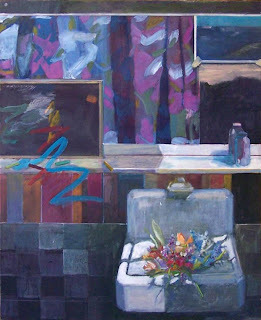 I blocked this painting in and it really looked like nothing...it was only as I started working very specifically - area by area, edge against edge, color against color that it became dramatic. 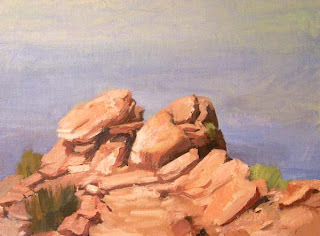 This painting is almost all done with the palette knife, though it is a Sedona scene it somehow resonates as a South American colonial sort of thing with a hint of the tropical at a high elevation. This was done on Father's Day and depicts my daughters on a recent trip to Lawrence KS. A gift to my Dad - Happy Father's Day! Another moment creates a whole different composition. 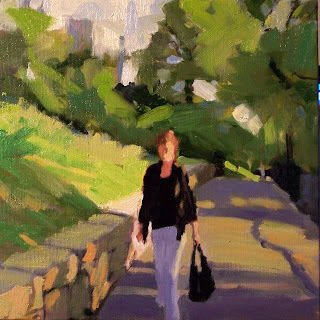 A quick study of a moment in the day. An evening walk at Riverside park.